The Android TV service with Netflix debuts in Greece. 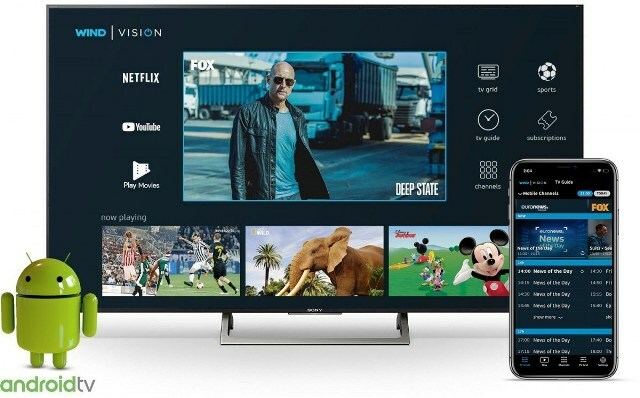 The Greek telecommunications company Wind has partnered with Google to launch Wind Vision, the first pay-TV platform in the country with Android TV. Wind Vision is also the first platform in Greece that integrates Netflix in the user interface. Its offer also includes more than 60 live television channels, including worldwide networks such as Fox; the Disney, Nickelodeon and BabyTV children's channels; documentary channels National Geographic, Viasat History and History; the music channels MTV Live HD, Stingray Vibe and iConcerts; fashion channels Fashiontv, World Fashion and Luxe.TV; news networks Bloomberg TV, BBC World News and TV5 Monde; and sports channels Extreme Sports, Ginx and Outdoor Channel. Wind Vision also offers all NovaSports channels. It is available to all new and existing customers of Wind landlines in two plans, the Family Pack, which costs € 9.90 a month and offers access to more than 60 live and Full Pack channels, priced at €24.90 a month, which also includes the NovaSports channels. Wind Vision customers will be offered, during a promotional period, a free Netflix subscription of three or six months. As the first Android TV service in Greece, Wind Vision will also offer uninterrupted access to all Google services, including Google Play Movies, popular music applications, YouTube, Google Play Games and more than 3,000 apps on the Google Play Store. It also presents the spectators with features such as 4K and HDR, exclusive EPG, multiscreen, on demand (update and restart of the seven days), turning any smartphone into a remote control and a Bluetooth connection with peripherals. Commenting on Wind Vision, Nassos Zarkalis, president and CEO of Wind Hellas, said: "It's a unique television experience. "We offer our customers a new way to watch TV and video content." Wind Vision brings together a large amount of streaming content, traditional television channels and user-generated video content in a state-of-the-art video solution. real, now available on all screens. " He added: "Today we announce a key partnership with Netflix, a global entertainment network that offers users a great content universe." We are proud that Netflix has partnered with Wind Vision in the Greek market, recognizing the innovative features of our Soon we will announce more aspects of this strategic partnership. "